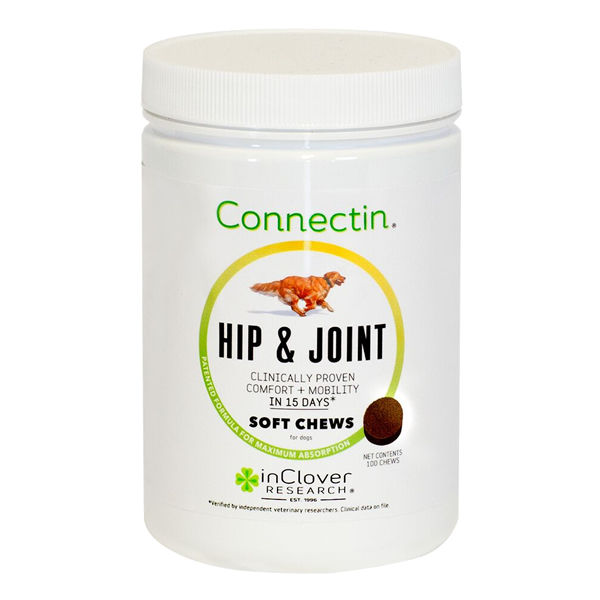 Connectin Hip & Joint Soft Chews - New Look! 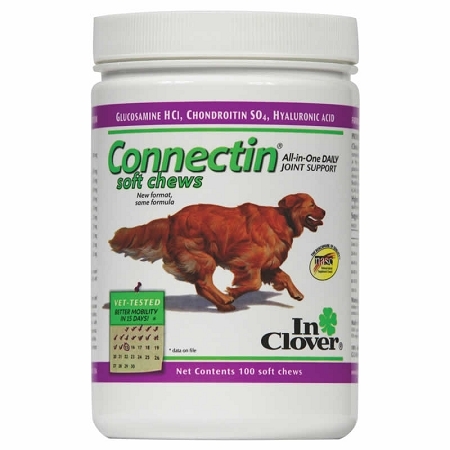 In Clover Connectin Soft Chews for Dogs contain glucosamine, chondroitin and nutrients that help reduce inflammation and joint pain in dogs. 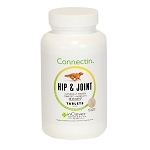 Connectin is a patented joint supplement for dogs that combines the natural joint building blocks of glucosamine, chondroitin and hyaluronic acid with the anti-inflammatory properties of yucca and cayenne. 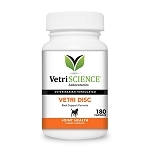 Clinical trials by independent veterinarians* showed Connectin improved mobility in dogs within 2 weeks. Each bottle contains 100 soft chews. 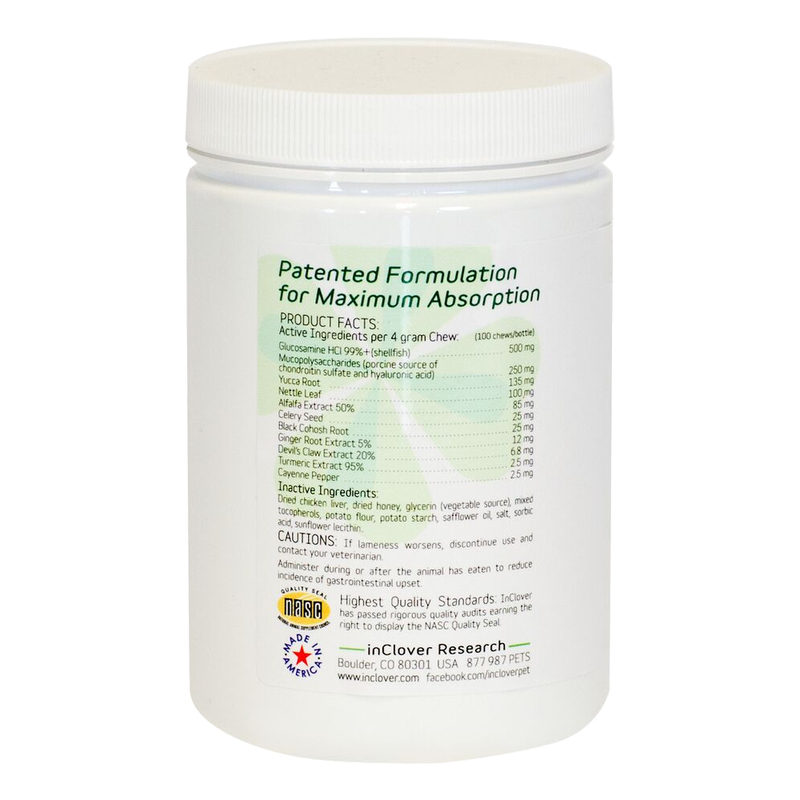 Also available in 150 chewable tablets., 50 tablets and 12 oz powder. 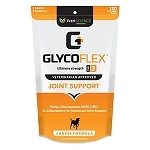 *A University study performed on Connectin by AVMHA accredited veterinarians on 88+ dogs show significant improvement in joint health within 15 days with no side effects. Absolutely incredible! My two older dogs (10 and 11) were stiff, could barely get on the sofa, and would whine from pain periodically. After a month on Connectin, they are friskier than they’ve been in years. Better then any of the other joint supplements I’ve tried. Have used this product for a year now. My 4 year old GSD gets 1 every morning. My 11 month old Std Poodle has just started getting 1 also. I give this product for preventative issues down the road. Both dogs love it. Super fast shipping. Great price. These chews are definitely helping my 11 year Westie with her back leg problems. This is our 2nd. bottle . . . plus she loves them ! 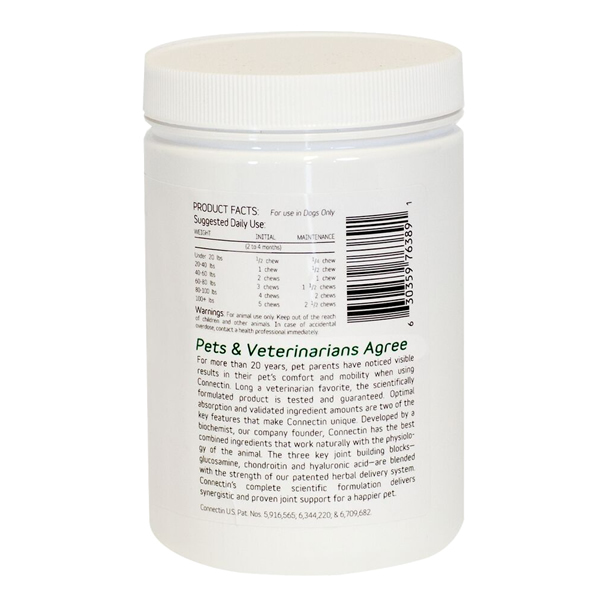 Mucopolysaccarides (porcine source of chondroitin sulfate and hyaluronic acid) - 250 mg.
Chondroitin is a cartilage component that promotes water retention and elasticity and inhibits the enzymes that break down cartilage. Yucca Root - 135 mg.
Nettle Leaf - 100 mg.
Alfalfa Extract (50%) - 85 mg.
Devil's Claw Extract (2%) - 68 mg.
Celery Seed - 25 mg.
Black Cohosh Root - 25 mg.
Ginger Root Extract (95%) - 12 mg.
Turmeric Extract (95%) - 2.5 mg.
Cayenne Pepper - 2.5 mg.
Inactive Ingredients: Dried chicken liver, dried honey, glycerin (vegetable source) mixed tocopherols, potato flour, potato starch, safflower oil, salt, sorbic acid, sunflower lecithin.